CGTalk | R20 Volume builder / mesh UV to Substance Painter texturing workflow? R20 Volume builder / mesh UV to Substance Painter texturing workflow? Modeling with the new volume builder is great but after meshing, off course the topology is very dense and fragmented. Now I’m trying to get a reasonable UV layout, with unfold3d, for an export to substance Painter. Because of the high poly count and the flow of the polys I’m not getting good results. 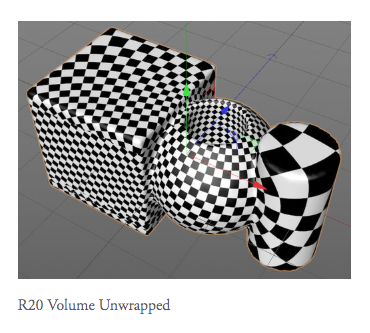 I was wondering is this even possible, UV map Volume Builder-models or is Tri-planer projection the only solution? I would be inclined to do some decimation on the resulting mesh. Either using Zbrush or 3D coat or similar software that does decimation and retopology. Kent is very helpful and has provided some useful plugins, but that looks like it might be a quick and dirty solution. If you want proper UVs with fairly equal UV sizes (notice the massive difference in size of the checkerboard texture), you’d probably still want to use something else to retopo anyway. It would be really useful if there were a way to equalize the UVs a bit.